Titles matter! 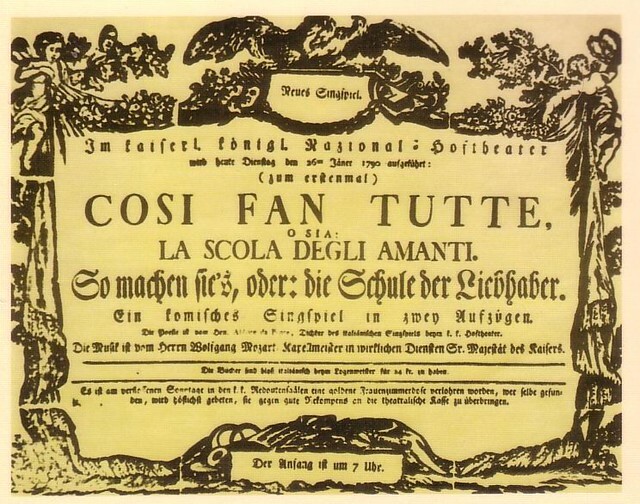 In the printed programme for a Leipzig concert on 18 November 1793, the source opera for a vocal trio is named as Così fan tutte!! – the double exclamation mark expressing outrage at the misogyny of the phrase ‘Thus do all women’. Much safer to stick with librettist Lorenzo da Ponte’s original, gender-neutral title, ‘La scuola degli amanti’ (The School of Lovers). But the dilemmas he and Mozart faced in the rest of the opera proved rather more difficult to solve. School dramas were common in 18th century Europe. As Da Ponte started work on his own institution, the template - where faults were exposed and consequences demonstrated, before reformation was required - was clear and he stuck to it. Fiordiligi loves Guglielmo, her sister Dorabella loves Ferrando, and Don Alfonso convinces the men to put their loves to the test. Disguised, each man seduces the other’s woman. The result is the total humiliation of the sisters. But if Da Ponte was hoping that this off-the-peg drama, with its stereotypical aims and routine mechanisms, would pose few problems in its construction, he quickly discovered otherwise. In order to be effective, the test has to awaken in the women feelings of new love powerful enough to supplant the old – feelings which then have to be cast aside in an instant when the deception is revealed. This would be implausible enough in a spoken drama, but when the new relationships have been sealed by some of the most glorious music of true love that even Mozart ever penned, restoring the status quo seems unthinkable. A few years ago, I undertook a detailed examination of the autograph of Così fan tutte. On the basis of palaeographical evidence, I suggested that, as a way out of their dilemma, Mozart and Da Ponte considered a radical alternative in which each officer sets out to seduce his own woman. However implausible the seduction scenes, at least the final reconciliation could embody some emotional truth. While it would have been highly unusual to have a situation in which the fundamental structure and the denouement of the drama were settled only at the last moment, the evidence around Così suggests this was the case. Take, for example, the climax of the Act II seduction duet ‘Fra gli amplessi’. Ferrando, working himself up for the last big push to win over Fiordiligi, observes that someone’s ‘constancy’ is wavering – but whose? ‘La mia’ (my), ‘la sua’ (her), or ‘la tua’ (your) are all there in the palimpsest, repeated deletions betraying an extraordinary level of uncertainty at the very crux of the drama. These linguistic tangles are symptomatic; in the autograph as a whole, there is a pervasive sense that the composer and librettist were making aspects of the plot up as they went along. The authors faced intractable problems and a genuine impasse when it came to the ending. The libretto ducked the question of what happens next altogether. No stage direction indicates whether the ‘amanti’ should make it up with their original loves or accept the reality of their new-found passion. In the frantic final days of the creative process, Da Ponte and Mozart found themselves embroiled in their own school – a school like no other. This is an edited extract from Ian Woodfield’s article ‘La scuola degli amanti’, available to read in full in The Royal Opera’s programme for Così fan tutte. Così fan tutte runs 22 September–19 October 2016. Tickets are still available. This production will be broadcast in cinemas around the world on 17 October 2016. Find your nearest cinema screening. One can only let the piece speak for itself and let the overall impression leave it's mark!